Student: A woman is holding a little girl. It may be her daughter. 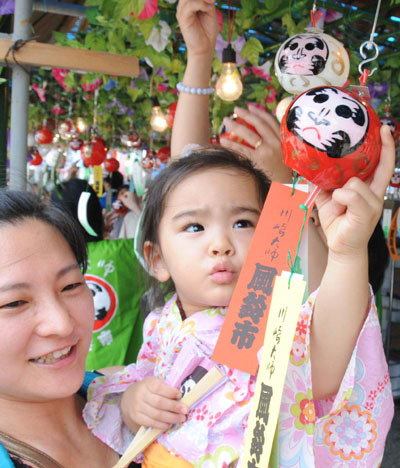 The little girl is touching a. . . What is furin in English? Student: The girl is touching a wind chime. Teacher: What pattern is on the furin? Student: It is a daruma pattern. Teacher: How would you describe daruma? Student: Daruma dolls are dolls without hands or legs. They are round, and they have a beard and two big eyes. When you get a daruma doll, the eyes are usually white. You make a wish when you paint in one of the eyes, and when that wish comes true, you paint in the other eye. They are a symbol of determination and strength. Teacher: Very good. What is the girl holding in her other hand?